The ‘Long-term Plan’, which was unveiled this month, provides critical insights into where and how money will be spent to accelerate the redesign of patient care and ‘futureproof’ the NHS for the next 10 years. The document, which will inform local NHS organisations’ plans, explains how the NHS will be structured to deliver holistic, preventative and place-based care systems that will be measured on their ability to harness medtech industry innovation in order to transform care. In terms of NHS structure, the integration of health, social care and related services forms a central pillar of the plan which states that, by April 2021, all areas of England will be covered by an Integrated Care System (ICS) with typically just one Clinical Commissioning Group (CCG) per ICS area. ICSs will see primary and secondary care and other healthcare providers strategically integrated into wider systems as they move from organisation-based care to place-based care. This will alter the way that services are staffed and resourced, and where and how clinical services are provided, bringing big changes to the medtech customer base. The plan also promises £4.5 billion of new investment to fund expanded community multi-disciplinary teams within ICSs, which will comprise a range of staff such as GPs, pharmacists, district nurses, community geriatricians, dementia workers and Allied Health Professions (AHPs), such as physiotherapists and podiatrists/ chiropodists, joined by social care and the voluntary sector. These multi-disciplinary teams will be aligned with Primary Care Networks (PCNs), based on neighbouring GP practices that work together, typically covering populations of between 30,000 to 50,000 people. According to the plan, the NHS aims to speed up the pipeline for developing innovations in the NHS, so that patients can access proven and affordable innovations faster. In line with this, it pledges to “create a simpler, clearer system for medtech and digital that will apply across England. This will include a new advisory service for innovators, linked to the Academic Health Science Networks (AHSNs)”. All ‘horizon-scanning’ activities, such as the online service, HealthTech Connect, will also be brought together in one place. The plan promises more money and opportunities to get digital technology, such as remote health monitoring equipment, tested quickly since the NHS plans to extend the current NHS England ‘Test Beds’ through regional Test Bed Clusters from 2020/21. These will provide more opportunities for products to be tested in a live environment so that real world, value-based evidence can be obtained. The NHS also wants to accelerate the uptake of proven, affordable innovations through a new medtech funding mandate. This would apply to health tech products, other than pharmaceuticals, which have been assessed as cost saving by NICE. The NHS also plans to significantly increase the number of NICE evaluations for these products, giving greater scope for the assessment of digital products, in particular. The NHS will invest in spreading innovation and AHSNs’ funding is guaranteed until April 2023 if they are successful in doing so. AHSNs will link even more closely with other regional support, such NHS RightCare and Getting It Right First Time (GIRFT), which are designed to reduce unwarranted variation in patient care and outcomes. ICSs will be judged on their performance on adopting proven innovations and this will become part of core NHS performance metrics and assessment systems, as well as benchmarking data. The NHS spends nearly £6 billion a year on hospital consumables, including syringes and gloves, and common goods. 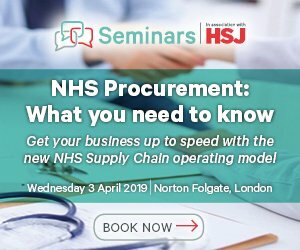 To help make procurement savings, it plans to double the volume of products bought through its centralised NHS procurement organisation, Supply Chain Coordination Limited, (SCCL), to 80% by 2022. Elsewhere in the NHS, many service contracts have already been moving away from Payment by Results (PbR). ICSs will introduce whole population budgets, with increasing amounts of risk share and outcome parameters. Care will be contracted by the strategic CCGs covering the ICSs, and often delivered by integrated care providers with a lead provider which will probably be the local trust. With many new key stakeholders in the NHS decision-making mix and new joined up financial systems, medtech companies must think about the bigger picture and determine how a product could deliver added-value across an entire care pathway. This involves thinking about the wider cost implications of a product such as failure rates, inpatient stays and infection rates. To help medtech companies better understand some of the changes that are happening in NHS procurement, Wilmington Healthcare will be running a free webinar on how to engage with the new procurement category towers. The guest speaker will be Mark Hart, tower director – Tower 6, Cardio-Vascular, Radiology, Endoscopy. The event will be held on Thursday 7th February from 12-12.45pm. To find out more details and register, click here. The plan makes it clear that innovative medtech devices will be key to transforming patient care in the next decade; hence it is particularly good news for companies with affordable technology that delivers proven results. However, to capitalise on these opportunities, the medtech industry must show a clear understanding of how its products fit into the new care pathways that are being created within ICSs and where and how they can deliver benefits across the whole health and social care system. The Future Operating Model (FOM) is now THE operating model and was introduced following the Carter Review to encourage transparency and standardisation across procurement in the NHS. Oli Hudson and Steve How decipher the Future Operating Model, the inevitable abundance of acronyms and examines the impact on trusts and their suppliers.